Look: Comes in plastic package. 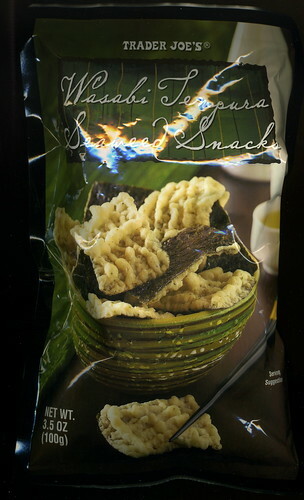 Individual snacks look like waffle-cut seaweed fries. Pour: Light brown with green overtones. Nose: Hints of clay, sea breeze, elderflower, tobacco, and chocolate. Mouthfeel: Fried battery taste at first, easing into pleasurable horseradish spice. Aftertaste of seaweed and bitterness. Drinkability: Good to medium. Blends well with plain yogurt. Serve with: fish, chicken, more seaweed, and pasta. I was told that once a bag of these snacks was opened, it was impossible to not finish it in one sitting. That assessment, I can easily inform you, was not a little flawed. These are good snacks but tend to fill you up more than may have been desired. What if I just want 7 chips? Or 2 mini sushis? These snacks would not be a suitable replacement as they fill you up too much and the bitterness makes you simultaneously more hungry and full. They tend to cross the ever-so-delicate line between snacks and side dishes. Not in a good way, either. This recipe I found does not seem too appetizing.